Vintage Theatre Co-op is Adelaide’s only community theatre workshop program dedicated to providing stage performance opportunities for the older person (65+). Join us as we present a selection of short stage performances, songs and music by participants and friends of our "Don't Act Your Age” community workshops. 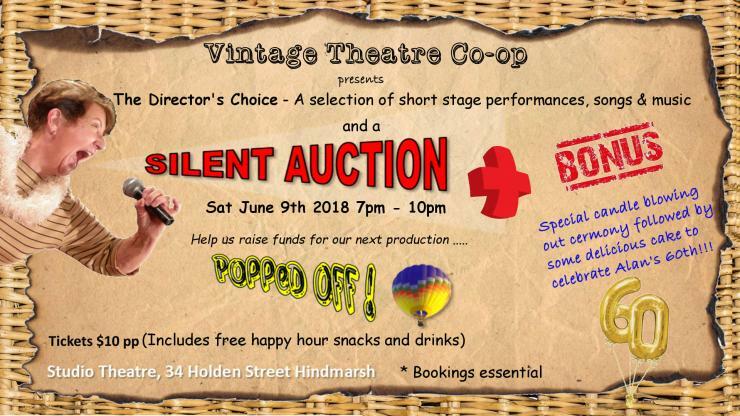 We will also be holding a silent auction of goods to help raise funds for our next major production "Popped Off" which is being developed for older community actors. Oh ... and enjoy a bonus slice of delicious birthday cake with tea and coffee at the conclusion of the night as we celebrate the 60th birthday of our artistic director Alan. Includes food & drinks (first hour only). Vintage Theatre Co-op is a program of Vintage Creative Therapies.